I liked my old covers, I really did. But something about them wasn’t quite right. They didn’t say “Historical” enough–and after all, writing books set in Moorish Spain in the 1480s should say historical, shouldn’t it. 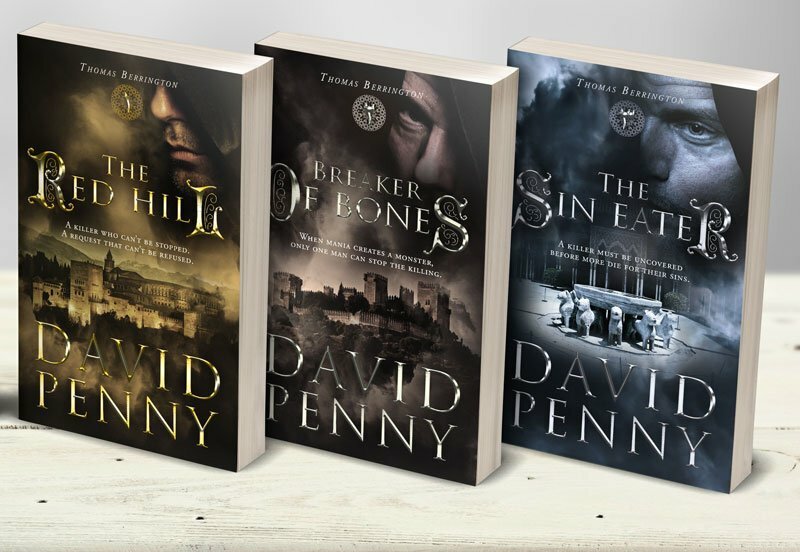 So I commissioned a new set of covers, to coincide with the forthcoming release of The Sin Eater. The fantastic Jessica Bell has done a great job on re-branding the books so now the covers tell you exactly what you can expect inside. A little bit dark, a little bit mysterious, but above all historical. You can see the new covers below, and soon you’ll be able to read The Sin Eater as well. Will there be a sixth Thomas Berringer book? HI Ruthe – yes, there will. The writing starts tomorrow (26th Feb 2018) and planned publication date (at the moment) is the 7th October 18. And the eighth book is also planned for later this year, around the end of November. Thank you! I LOVED all of the Thomas Berringer books, read them straight through! I appreciated all of the historic details the stories contained even some of them were almost unbelievable: cataract surgery hundreds of years ago?!? Thank you for great books. I love the very humanized characters and historical setting. I pace myself when reading them so they don’t end too soon. I’m glad you are working on the next one.